Black Canyon Coffee opened its first branch in the Philippines just this morning at the Food Street wing of SM Southmall in Las Pinas. The grand launch was graced by no less than the honorable Las Pinas Congressman Mark Villar. He was joined by Mr. Pravit Chitnarapong (CEO, Black Canyon Thailand), Mr. James Dy (Chairman, Royal Thai Food Philippines Inc.), and Mrs. Wilma Dy (President, Royal Thai Food Philippines Inc). 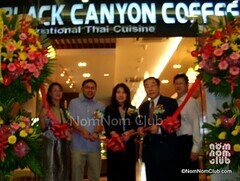 A big brand in Thailand that started in 1993 and now has 220 stores and 40 more internationally, Black Canyon Coffee is known for their unique concept of a coffee shop that ‘is’ also a full restaurant. 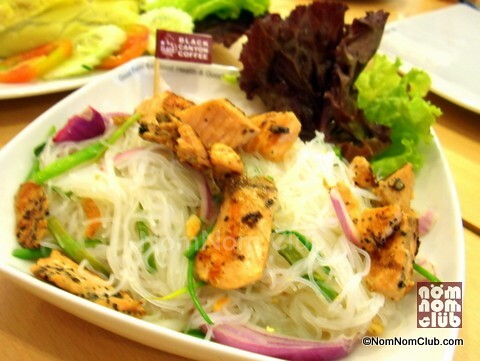 While they offer a wide range of coffee drinks and beverages from espresso to cappuccino (and ‘Blackpuccino‘), they also serve Thai cuisines such as Tom Yum soup and Som Tam salads. On the other hand, their brand ‘Black Canyon Coffee‘ can be easily misconstrued as a western brand whereas their specialties are Thai food. I personally tried the BC Thai Iced Tea w/ milk, BC Iced Coffee, and BC Iced Lemon Tea, in that order of preference. I loved the authentic mix of the Thai Iced Tea just like in Thailand and the Black Canyon Iced Coffee which is a blend of arabica coffee with two kinds of milk and plenty of ice. However, I found the iced lemon tea just ordinary. I then ordered one of their signature beverages – the Black Canyon Frappe. It was a refreshing drink in a visually appealing presentation with a fat glass, similar to the Black Canyon Iced Coffee. For a cost of Php 120, it was well worth the price given that they source the coffee beans from Columbia. The other raw coffee beans are from Northern Thailand while the Matcha Green Tea are from Japan. 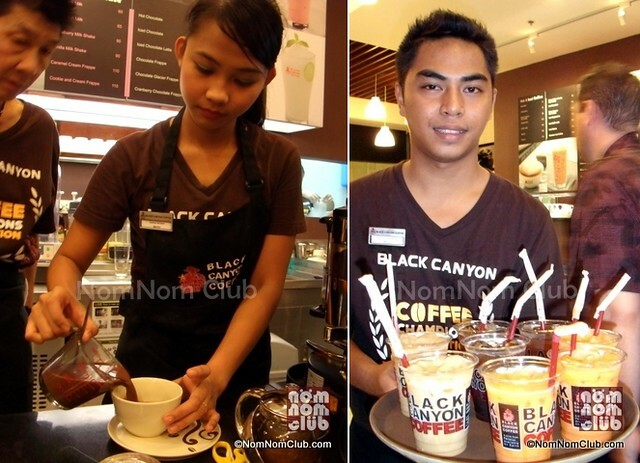 More than just a coffee shop, Black Canyon is actually a 160 sqm. full-restaurant that can accommodate upto 90 customers and offers Thai cuisine ala carte from soups, sandwiches, to pasta, and steaks. 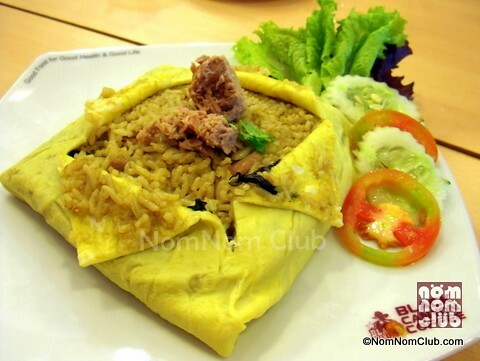 Four of which I have tried are the Pad Thai, Tom Yum Goong, Tuna Green Curry Fried Rice Wrapped in Egg Sheet, and the Spicy Glass Noodles and Grilled Salmon Salad. The Tom Yum Goong (Spicy Prawn Soup – Php 192) had the right level of spiciness for an authentic Tom Yum Goong. Although the Tuna Green Curry Fried Rice is not really my type of food, curry lovers may want to try this one out at a good price of Php 156. The Spicy Glass Noodles with Grilled Salmon was something new to my taste bud, and it turned out well. The spicy and lightly grilled salmon complemented the glass noodles. They could have oiled the noodles a little-bit more, however. Called Yum Wun Sen Salmon in Thailand, this Thai delicacy is priced at Php 188. And finally, you should not miss Black Canyon Coffee Philippines‘ authentic and award-winning Pad Thai which is at par with other Thai restaurants I have dined-in here in the Philippines. The shrimps were fresh and larger than I expected for a Pad Thai complemented with bean sprouts, garlic chives, and eggs. They also have desserts and bakery products. I was able to try the Fruit Salad Sundae (Php 68) and a slice of Oreo Chessecake (Php 95). The former was just ok and nothing special but the cakes were good. Priced at less than a hundred, this is a very good deal. It was also great to have met with Black Canyon Executive Chef Rasri Athaboh who came from Thailand. He will be staying in the Philippine for a while to oversea the kitchen and knowledge transfer. Black Canyon cooks and crew were also initially sent to Thailand for over a month of training. If you browse through their menu, you would notice that the drinks are almost always below Php 100. The Thai dishes also range only from Php 150 to Php 200; with some a little above Php 200. I hope they do maintain, more or less, these affordable introductory prices within the year. 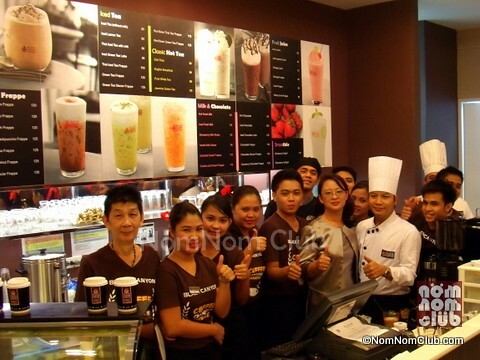 Black Canyon Coffee (BlackCanyonCoffee.com) also has presence in Singapore, Malaysia, Indonesia, Myanmar, UAE, Cambodia, and Laos. 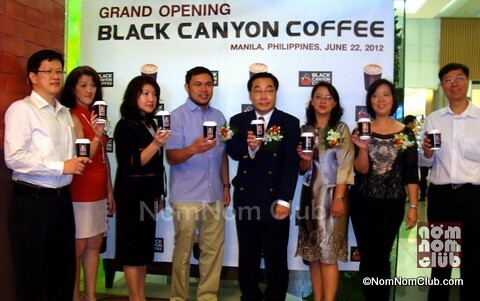 In the Philippines, they are looking at 2 more new Black Canyon Coffee branches within 2012; watch out for BCC in SM Mall of Asia and SM Megamall. 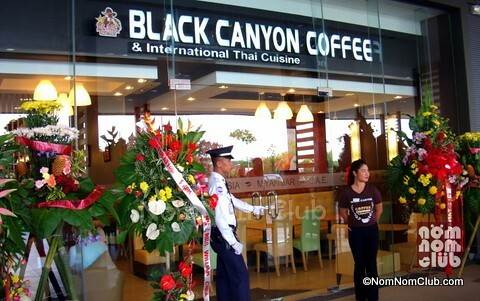 Ah, yun pla ang Black Canyon Coffee. Can’t wait to try. hmmm, interesting new place to try. Black Canyon is really a great restaurant! 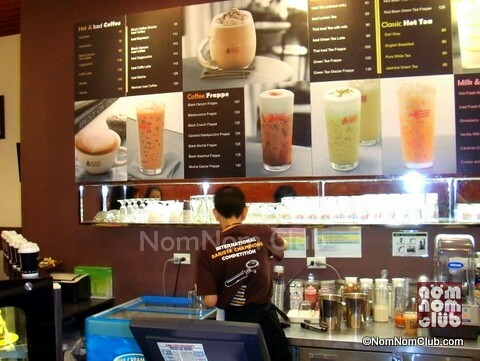 I want to visit them in Philippines as soon as I get home… Thai Cuisine and Coffee what a “Perfect Combination”.